The The Click-N-Hit compact, portable, discrete, smoking device is unlike any other vaporizer that is available on the market today. The Click-N-Hit is built to be compact and portable, making it an all-in-one solution, so you can enjoy the best smoking experience anywhere you like. Click-N-Hit at home, in the car or wherever you feel the need to smoke. You can keep it in your pocket and forget about it until you feel the need to Click-N-Hit. Multitasking becomes simple with its easy one handed use for smoking on the go. 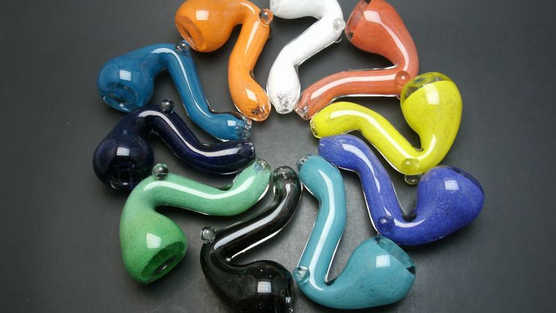 The Click-N-Hit “Vaporizer” comes in multiple colors and designs. At the low cost of $19.95 per unit, this is the best deal you can get for the smallest and most discrete “all-in-one” smoking pipe device on the market! Buy 3 and it ships FREE. Buy 4 getthe 5th FREE and FREE SHIPPING. Forget your old “one-hitter and dugout” – this new design is more ergonomic, efficient and a joy to use. I had a great opportunity to have a discussion with Jay from Grateful J's in Florida. I had some concerns regarding the law changes in Florida regarding pipes and wasn't able to find any accurate information. Jay explained to me what the actual law is all about and how the media has been reporting incorrect news. Jay formed The Florida Smoke Shop Association to bring smoke shops and glassblowers together in effort to fight the bill and in an unified manner. Jay agreed to update us with latest information about the law changes in FLorida and we thank him for it. Below is the email I received from Jay that explains a little more about FSSA. "The Florida Smoke Shop Association (FSSA) has been established to bring the Florida smoke shop industries stores, glass blowers and vendors together to protect and defend ourselves from parties interested in taking away our livelihoods. On the other hand it gives us the opportunity to work openly in the political arena to build a stronger community. Working with our Lobbiest and attorney the FSSA was successful in having HB49 amended from its original wording banning smoking pipes in Florida. Any stores interested in becoming a member of the FSSA can contact us through our website floridasmokeshops.org or by contacting grateful j work by private message on Facebook. " Tennessee to ban kratom on July 1st, 2013. This bill was passed April 16th, 2013 and signed by the governor. the state of TN associated Kratom with spice and bathsalts just like the main stream media. Once again this shows how ignorant our politicians are who don't even spend 2 minutes to research what Kratom is. Or perhaps they are simply in the pockets of big pharma and don't care about the benefits of Kratom and the fact that it helps hundreds of thousands of people. Read the full bill to ban Kratom in Tennessee. Send the governor of TN a message about Kratom, maybe he will learn the benefits of Kratom and possibly get this amazing herb off the ban list. If you are a smoke lover and you want to experience one of the finest head shop in Miami region, then this read will defiantly attract your attention. Cigarette lovers know that it takes mastery of the art of making cigarettes to come up with a nice blend of smoke. Blending a smoke that will give the smoker a unique experience in smoking takes experience, passion, talent and a keen sense for flavor and aroma. Our passion to explore the best smoking products has led us to open Brickell Smoke Shop . We are situated at 13 SW 7th Street Miami, FL (next to The River Oyster Bar & Tobacco Road). When it comes to the smoking products in the Miami region, we are one of the best choices available for you guys. Either you want to entertain yourself with Cigar or with Cigarettes, you want to have some fun with Hookah or you are dying to taste some finest Glass Pipes in the town, Brickell Smoke Shop in always there for you. We are pleased to announce a new feature which is available on the homepage of the site. We now track popularity gain and decline of smoke shops based on the number of Facebook fans they are either gain or losing. You can view a top list by Week, Month overall or you can view a top list for your state. View the homepage to check out this new feature. The stats will begin updating on 4/26/13. Fan increase and decrease will display as 0 until then. So a few homeowners complained in Houston that they want nearby smoke shops to shut down and go out of business because their teenage kids might go there and turn into drug munchin addicts or something. I just have one thing to tell these parents: Why don't you shut down your home and move somewhere else? I heard Alabama is pretty good, has lots of nice folks and churches. New Mexico is great too if you want to never see a green colored bush. Look, here's the thing you idiot parents. It's not that the smoke shops are a bad influence on your stupid kids, it's that you can't control your kids so you want to blame the one thing that you know will cause others to agree with you. How about shut down nearby McDonalds so your kids might not die of heart attack? Maybe shut down Walmart because your kid may want buy every new game and toy and bicycle and tv and everything else they sell so you don't go bankrupt? Stop blaming businesses because you can't control them and take some responsibility yourself. Besides, the pharmaceutical companies give your kids drugs legally through a doctor, you should be more worried about that then some smoke shop selling a pipe or an electric cigarette or melatonin filled brownie. I'm done ranting, read the full article by clicking on the title if you care to. The government's war on drugs have failed so they're going after the glass? really? So if someone starts smoking stuff out of an apple, there goes my apple too! This is so ridiculous, I don't even know if I'm in reality or posting this in my dream. Banning glass pipes is completely unconstitutional. Regardless if you're a Floridian or not, please help this cause by simply posting your information on Change.org. This will kill 1000s of jobs in Florida and 100s of smoke shops throughout the state. This is not the American freedom anymore. We must stand up and fight back the Florida House Bill 49 - also known as the "Bong Ban". Please visit THIS LINK to sign the petition. Let's repeal Florida House Bill 49 and save the smoke shops and glassblowers.